Joseph Robinette "Joe" Biden, Jr. (born November 20, 1942) is the 47th and current Vice President of the United States, jointly elected twice with President Barack Obama, and in office since 2009. A member of the Democratic Party, Biden represented Delaware as a United States Senator from 1973 until assuming the office of Vice President in 2009. 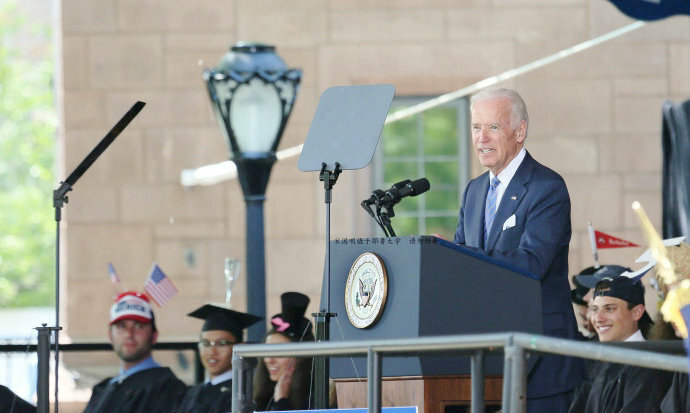 Biden was born in Scranton, Pennsylvania in 1942, and lived there for ten years before moving to Delaware. He became an attorney in 1969, and was elected to the New Castle County council in 1970. Biden was first elected to the Senate in 1972, and became the sixth-youngest senator in U.S. history. He was re-elected to the Senate six times, and was the fourth most senior senator at the time of his resignation to assume the Vice Presidency in 2009. Biden was a long-time member and former chairman of the Foreign Relations Committee. His advocacy helped bring about U.S. military assistance and intervention during the Bosnian War. He opposed the Gulf War in 1991. He voted in favor of the Iraq War Resolution in 2002, but later proposed resolutions to alter U.S. strategy there. He has also served as chairman of the Senate Judiciary Committee, dealing with issues related to drug policy, crime prevention, and civil liberties, and led the legislative efforts for creation of the Violent Crime Control and Law Enforcement Act, and the Violence Against Women Act. He chaired the Judiciary Committee during the contentious U.S. Supreme Court nominations of Robert Bork and Clarence Thomas. Biden unsuccessfully sought the Democratic presidential nomination in 1988 and 2008, both times dropping out early in the race. Obama selected Biden to be the Democratic Party nominee for Vice President in the 2008 U.S. presidential election, which they won. Biden is the first Roman Catholic, and the first Delawarean, to become Vice President of the United States. As Vice President, Biden has been involved in Obama's decision-making process and held the oversight role for infrastructure spending from the Obama stimulus package aimed at counteracting the Great Recession. His ability to negotiate with Congressional Republicans played a key role in bringing about the bipartisan deals that resulted in the Tax Relief, Unemployment Insurance Reauthorization, and Job Creation Act of 2010 that resolved a taxation deadlock, the Budget Control Act of 2011 that resolved that year's debt ceiling crisis, and the American Taxpayer Relief Act of 2012 that addressed the impending "fiscal cliff". Obama and Biden were re-elected in 2012, since which time Biden has publicly considered running to succeed Obama as president in 2016. Throughout his career, Biden's political style has combined appeal to middle and working class voters with a penchant for gaffes.